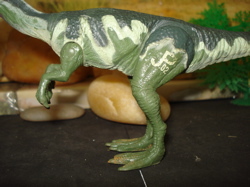 The Jurassic Park JP02 Dilophosaurus was called "The Squirter." ... which made sort of a screaming sound and opened its mouth when you pressed down one of its arms (I think it was/is the right one). That frill around its neck was removable and losable too. 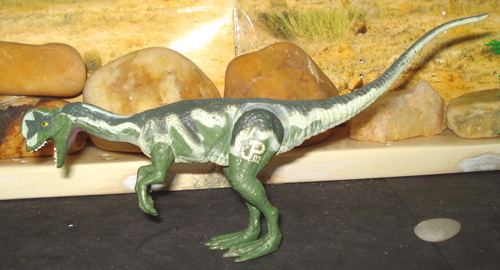 But the big deal about the JP02 Dilophosaurus (the "02" is the number it was given in the Park- each Dinosaur had a code number beginning with "JP") was that it spit poison, blinding its prey. Did it? I don't know. 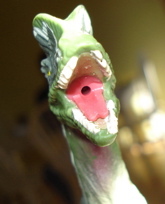 Unfortunately after fifteen years or so she'll get the last laugh as now the best any of my three JP02 Dilophosaurus could do was drool. These did not come with a frill although they did come with a 'trading card' and have "capture gear" (a favorite accessory) of their own, and of which I have none. 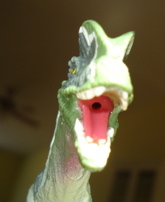 Mine are free-range JP02 Dilophosaurus. 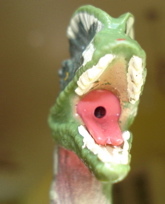 The pictures below give a great view of the Dilophosaurus mouth and that 'squirt hole' at the back of the throat. Interestingly enough the tongue and 'squirt hole' are a separate insert fitted into the back of the mouth. This in no way exhausts the different companies that have produced Dilophosaurs for enjoyment and for profit. ... at one and one-quarter (1.25) ounces (37 gms). The height will vary depending on how you choose to pose this little guy. (See the first photo at the top of the page.) The legs swivel at the hips in what has turned out to be a very long-lasting, tight joint. "Are those spikes on your back or are you scared to see me?" had they in fact been contemporaries. Which they are today. 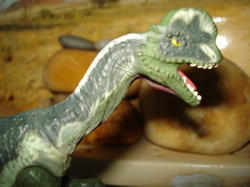 (Below) A JP02 Dilophosaurus stalking its prey, such as it may be. 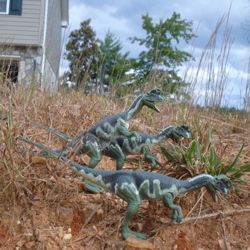 And here we see a pack of JP02 Dilophosaurus as they wander about my rain tiered backyard. When these first came out I was initially underwhelmed. But as time has marched on they have grown on me. Yes, they are bit rough but they are really rugged, quite capable of extended play out in the yard and if left outside harsh weather has very little effect on them or their play-with-ability. These are about as good today as they were out of the box, or off the card, as it were. While the legs are pose-able the arms are unfortunately locked in place. 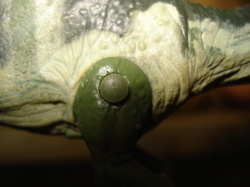 The arms are held in with a plastic rivet that seems to go straight through from one side to the other. The "arms" themselves are bedded in niches set into either side of the chest and while this does limit what the JP02 Dilophosaurus can reach for it has eliminated (or at least lessened) the likelihood of the arms coming off. 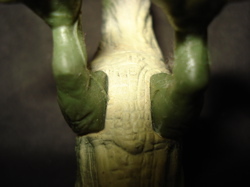 The "hands" aren't badly sculpted at all and have quite decent detail on both the inner (palm) and outer (back) parts. A pack of these can cause a lot of havoc in a quiet neighborhood. "This neighborhood ain't so quiet anymore!" 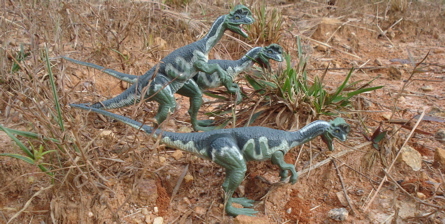 You can see three different poses of the JP02 Dilophosaurus in the above mated photos. it really looks good and almost alive as it stalks through your front yard (below). 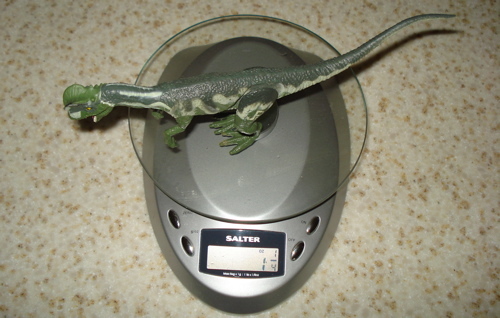 No, the detail isn't up to the quality of today's Dinosaur toys. But these were manufactured seventeen years ago. Things have changed a lot in less than two decades. 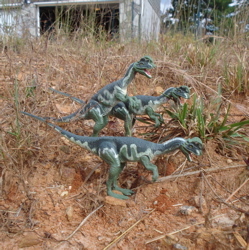 The variety of greens, ranging from a very dark on the upper surfaces to a very pale green on the underbelly, from neck to tail, help the JP02 Dilophosaurus to blend in with its environment, if that environment is the yard. The throat, under the jaw, is a hot-pink or sultry Rose color, blending into the pale green of the neck. As you can see each JP02 Dilophosaurus is relatively unique, some darker, others lighter. Each has a similar but slightly different pattern of greens and Rose. "Excuse us but you seem uniquely capable of pointing us in the direction of the luncheon buffet." it finds itself a bit outclassed, sizewise and if it has any sense it will seek out smaller prey. "You look like our type. Let's go have lunch." 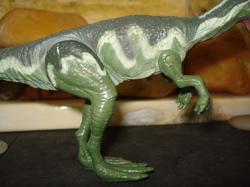 The feet of the JP02 Dilophosaurus also tend to vary in relative placement. Whether due to age or manufacture I do not know, but some have a wider, others a narrower stance. I do not know whether this is an anomaly of the manufacturing process or has happened as the result of being in a toy box most of their existence but the balance on these is so good that it really makes no difference when setting up on a desk, floor or just letting them play outside. "Actually we were hoping you have a smaller relation...."
And, perhaps luckily for them, he does. 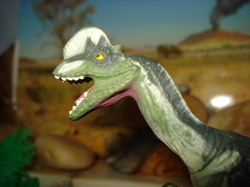 This JP02 Dilophosaurus is really a terrific toy, even if it no longer serves the specific squirt-purpose it was designed for originally. Rexford kinds likes it himself. "They are cute little fellas." Other views, top and bottom, can be seen above and below. 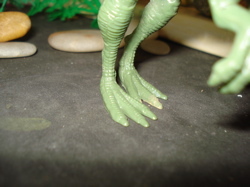 Of at least passing interest are the little holes in the bottoms of the JP02 Dilophosaurus feet. The feet themselves are perfectly flat and without detail. 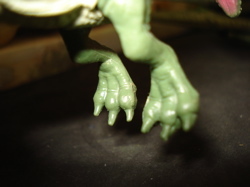 I've seen GI-Joes, Star Wars figures and the JP humans (in which I never had much interest) with the same holes in their feets. Why? I dunno. 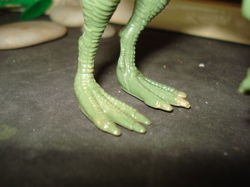 Virtually none of other JP Dinosaurs have holes in their soles! An anomaly for the only water-spewer in the Jurassic Park Hole of Fame. All in all. These are pretty terrific as toys. 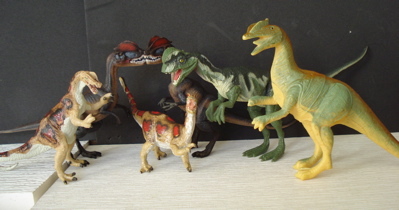 They fit in, one way or another, with not only their Jurassic Park toy-theren but with other brands as well, such as Carnegie, Safari, Bullyland and Papo. They are reasonably poseable and virtually unbreakable. As collectibles they are ranging (on eBay) in value from 99c (and $1.99) loose to just over $33.00 unopened (as new and mint) on original card. This figure gets very little respect. Back in the day it was really the poor relation to the other JP Dinosaurs. Today its collectibility is in question. 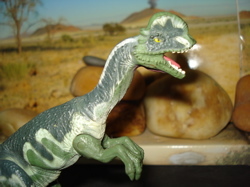 Personally I think it was, is and always will be little more than just another early 1990s, fine toy Dinosaur. "Whaddya mean! Not only am I collectible I make a great lawn ornament." 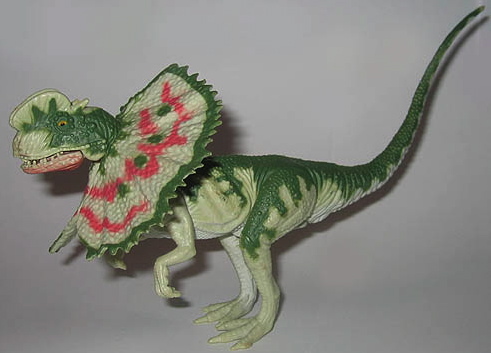 Given current concern(s) over the toxic effects of toys on children (while so many video-games toxic effects are overlooked) the 1993 JP02 Dilophosaurus must be considered as collectibles and no longer as children's Dinosaur toys. They have not been tested, verified, validated or had their chemical constituents classified. All that has happened is that they have been played with by children for seventeen years (they are out of production) without ill effect. I do remind you of the the tongue/throat insert that could come out and be swallowed by a young child. There's your sign. 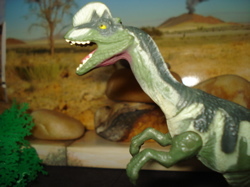 While these aren't the best available Dilophosaurus I would suggest that if you have the opportunity to pick one up at a reasonable price ($5 or less) as either a collectible or as a toy, do so. 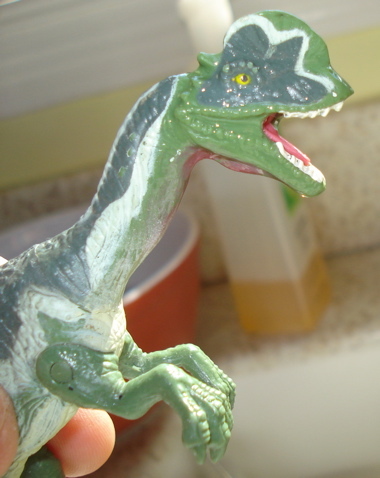 It'll add some spit and polish, or drool and polish, to your collection of Dinosaur toys. 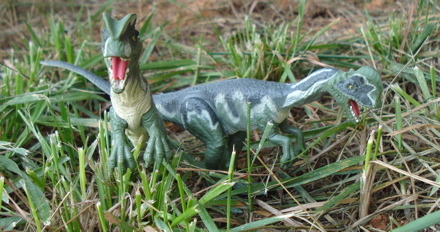 The JP02 Dilophosaurus was a member of the Theropod family. Read more about the Theropods by clicking this link.